Does your home have the blahs? You've painted and rearranged and read the books and done all the "stuff" and it still is just a house or just a room. What could make the difference? The answer is simply color. We struggle with what is the right color and sometimes we settle for a neutral color because we are afraid to be bold. The solution is really to pick your favourite color and work with it. Think about the colors you wear regularly that make you comfortable. This is a sure clue as to what you can live with long term. Do you wear splashes of color? Add splashes of color to your room. The decision comes with the value and the intensity of the color. Most of us can select the hue -- blue, red, or yellow. Let's use red as an example. If you wear red, red could be your choice of color for a room. Red can range in value from soft pink to terra cotta. It can be pure or greyed or be mixed with other colors. Select a paint possibility then to assist you with the final decision buy a small amount of the paint and paint a board about three feet by three feet. Place the sample board around the room. Check it out as you walk by. Do you like it under the window where there is a lot of light. How about in a dark corner? What are the effects of the color during the day, in the evening, at night? With the test completed analyze the results. If the color is too dark, lighten it. If it is too strong, add another color or white. Paint stores have the color selections on displays. Look at what is beside the color you have chosen. Go to the lighter side if the color is dark. Move to the grayed colors if the selection you have made is too intense. With the second selection, repeat the previous process. Remember that paint clerks work with color all the time and can be quite helpful. Ask their opinion. Remember that there is no wrong color for a room, only a wrong color for you. Next step-- What colors work with the one you have selected as your main color? If you are not sure, look for patterned fabrics and see what colors are combined. Repeat what you see in the patterns in proportion in the room. When colors are selected for a room don't forget the ceiling! Most of us settle for builder's white. That is not necessary. A ceiling colored the same as the walls provide a sense of intimacy. A ceiling painted in a complementary color to the walls makes the room look finished. An example would be painting the walls a sage green, selecting a soft gold for the ceiling, mouldings in vanilla cream, furniture in deep cherry with sofas and chairs in a variety of stripes or patterns in golds, greens and creams. Suddenly the room becomes tied together, intimate, balanced and inviting. Repeat the process room to room thinking about how the colors connect at intersecting walls and ceilings. Think as well about the view from room to room. Can you see the red room from the green room? Does it feel right? 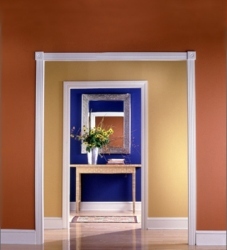 Color applied by painting is the easiest and the most economical way to change a room or an entire home. Experiment. The impact can be dramatic and very pleasing if time is spent thinking through the color selection process. Don't be intimidated by a few paint chips. Do the process. The results will be rewarding. Judy Christopherson has been an interior designer as well as a builder for over 20 years. She lives with her husband in Vancouver, Canada. In addition to her decorating articles Judy wrote about A Mother's Legacy.